Finnish startup Kopla Games was founded in 2015 by four former Rovio staffers with the mission to "introduce action RPGs to everyone." In February 2016, its debut title - provisionally titled "Project Nonstop" - was signed up by German publisher Flaregames. This went on to become Nonstop Knight, a Diablo-inspired, dungeon-crawling take on the idle game. After 2 million downloads in four days, it's officially Flaregames' most successful ever launch. And so, keen to find out more about the development process behind the game, PocketGamer.biz reached out to Kopla Games CEO Mika Kussisto and Dana Massey, Producer of Nonstop Knight at Flaregames. PocketGamer.biz: Kopla's mission is “to introduce action RPGs to everyone." Why did you decide that an idle game was the best way to achieve this? Mika Kuusisto: We are all big fans of Diablo so we wanted to take the long lifespan and the immersive experience of action RPGs and make it accessible to a wide audience, even to people who have never heard of Diablo. We were also really hooked on idle games and thought there could be a great synergy. We understand that calling Nonstop Knight an action RPG might raise some eyebrows when people start playing it, and they realise that they actually don’t have that much control over the character. 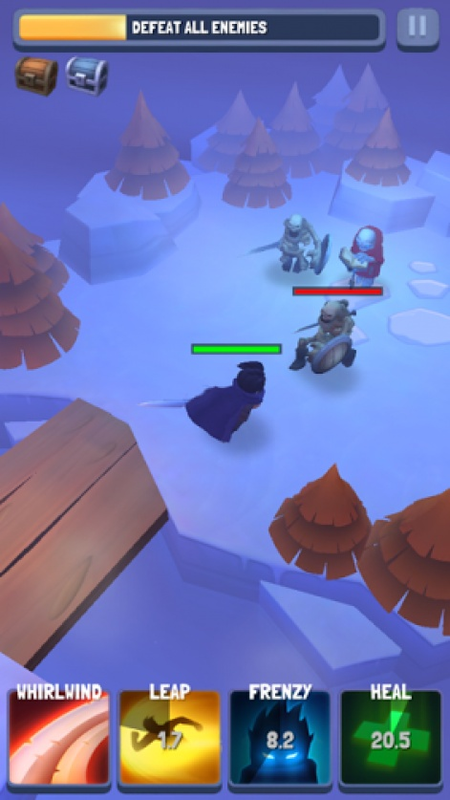 Some people have even called Nonstop Knight an idle RPG. Fans have had a difficult time categorising the game, but to us it's a great sign that we have discovered something fresh. And obviously the metagame has had a strong inspiration from idle games, but Nonstop Knight is not just your regular idler. The gameplay itself has a really strong look and feel of action RPGs and of course the best part the genre: lots of loot! The fans have had a difficult time categorising the game, since it is drawing material from a lot of different sources but to us it is a great sign that we have discovered something fresh. How much iteration occurred around the level of control the game handles and the level of control the player has? The control mechanics, meaning the character moving and attacking automatically with only few usable skills, has actually been the same since the first week of development. We hated virtual sticks and instead wanted to make the player focus on the most fun part of action RPGs: using the skills, gathering loot and making decisions. Since the early builds there has always been people who asked for more control over the character, but we stuck to our vision and kept polishing it a lot. Idle games typically have strong early retention and terrible longterm retention so what was your approach to boost longterm retention? We have seen a similar pattern in idle games, mostly based on our own experiences playing them. You start playing, advance rapidly, and when things start slowing down, the game doesn´t feel that rewarding anymore and players churn. On the other hand, a game series like Diablo has lived for decades and people still return to the earlier editions years later. So we wanted to combine those two: the really fun and addictive beginning of idle games with the long lifetime of action RPGs. Our goal from the beginning was to make the game really accessible but under the hood there is lot of depth with different item and skill builds. The Ascending feature is a great way to utilise this, making each ascension feel different while you grow more powerful and get closer to beating your friends on the leaderboards. About 75% of the players who are offered to watch an ad opt to do so. In the future we will be adding weekly events and tournaments. Idle games also typically have very low ARPDAU so what were your thoughts around boosting monetisation? We believe that keeping the monetisation light and not aggressively forcing the player to spend money in the game is really helping the game to grow in the long term. Sure, our store has gems and a cute little dragon thing you can purchase, but those are completely optional and the game can be enjoyed without spending any money. Currently, about 75% of the players who are offered to watch an ad to receive in-game currency or weapons opt to watch them. Some idle games - notably Futureplay's Farm Away - heavily use rewarded video ads, whereas you've been fairly light in your integration. Why's this? I would say the main reason is the whole mentality of the game being “nonstop”. Forcing the players to watch ads after, let’s say, killing a boss every 5 or10 levels would make the action slow down on-screen, and would contradict one of the biggest laws of the game. The player needs to be able to play the game at their own pace. The player can choose to watch the ad to receive coins or gear, but it should never hinder the action when the player wants to be “in the zone” and score those juicy multikills. How long did Nonstop Knight take to develop, and how many people were involved? The first version of the game was soft launched only after 6 months of development by the four founders of Kopla. During that time the game went through countless iterations and prototyping phases. We wanted to find out as soon as possible whether anyone would care about the game - if not, we were ready to kill it. If nobody cared about the game, we were ready to kill it. But great results from the soft launch validated that we were on to something interesting. This led us to signing a publishing deal with Flaregames and going all-in with Nonstop Knight. After the initial soft launch it took another 6 months to re-soft launch the game with Flare and then 3 months to the global launch and by that time we had grown to a team of eight, plus all the people on Flare’s side. How did Kopla and Flaregames get in contact, and why did this sort of idle game attract Flaregames, which up to this point has been publishing more core games? Dana Massey: Like so many things in Finland, it all started during a Destiny raid. Miikka, who handles Flaregames sourcing, and Janne, Nonstop Knight’s Lead Designer, play together and so naturally work comes up. At that stage, we had no idea what Kopla was up to, but it planted a wonderful seed. Based on this, once Kopla started looking more seriously for investment and publishing, Mika (Kopla CEO) and I met up at Game Connection in Paris last fall. Immediately, it was obvious they had something special and truly original on their hands. Beyond the game, it was an enlightening first meeting. From that first interaction, it was obvious he (and as we would later learn, the whole of Kopla) had extremely high standards. Normally, teams are just eager to show you the game. Mika grilled me. He wanted to know exactly what we would provide, how we would help. He wasn’t just looking for any publisher, he wanted a partner - and happily, we were able to provide that. The only reservation we had at all was 'does this game match our company portfolio pillars?' The answer to us was that if a game this good, with a team this strong, doesn’t match our pillars, our pillars are wrong. Above all else, we felt this was a game our players would enjoy and so signing it was a no brainer. We later then went back and revised the criteria we use to judge new games in light of what we’d learned. How did the relationship between Kopla Games and Flaregames work in terms of areas of expertise etc? The simple version is that we (at Flaregames) do all the boring stuff, so that the teams we work with can focus on making a great game. What we try to do with all our partners is be more of a co-developer than a publisher. This was never more true than with Nonstop Knight. We at Flaregames do all the boring stuff, so that the teams we work with can focus on making a great game. Signing the game was already a great deal of fun, but there was a lot left to do to finish it off and give it the best chance of success. There was also just a lot of boring stuff that needed to be put in place. Kopla was able to focus all their energy on the creative parts. On our end, we acted as foils and consultants to help grow the game. We’re able to provide them with access to more data and information upon which to make their decisions, but when we sign a team, we sign them because they do something extremely well and then let them do it. On the Flaregames side, we have a full game team assigned to the project that focuses on localisation, marketing, QA, community management, data, economy design and integrating Nonstop into all of our company’s central services. The biggest challenge, though, was the backend. In first soft launch, the game was completely offline. We had the challenge of creating a backend to power all of this, but to do it in such a way that the game works seamlessly online and off. Our two programming teams had to blaze some new ground in a very short period of time to pull this off and I couldn’t be prouder of what they were able to accomplish. What was the biggest challenge you overcame during development? Mika Kuusisto: Like for many other game startups, probably deciding when the game was ready to be soft launched and revealed to the world! It’s always scary to face the hard metrics and let people criticise your creation, but it is the only way to validate whether you are on the right path or not. We have been following lean philosophy, meaning that we want to start getting data and feedback from our end users as early as possible. Also, we have received an incredible amount of positive feedback and constructive criticism from other Finnish game developers, which truly helped us overcome some of the toughest design problems we had. In Finland the game development community is really open and helpful, which was the main reason we wanted to soft launch in Finland as well. When did you finally think you had come up with a game you were happy with? I think for me at least the realisation came when more and more people kept playing the game long after I ended my pitch in various game industry events and when I showed it to my closest friends and family. And of course, the initial numbers for the first soft launch looked really promising too in regards of retention, so we figured we might have found something unique. How did you approach soft launch, and did you change anything significant from player feedback? Really systematically. Everything we prototyped and tried in the game was tested with players before implementing to the final product. We changed a ton. The whole Ascension mechanic was implemented during the soft launch, and the entire pet system was missing until close to the end of second soft launch. The Ascension mechanic was implemented during soft launch, and the pet system was introduced late on. We received a lot of feedback regarding the speed the knight levelled up and ideas for different skills as well. Did you set out to target Asian markets, or has Nonstop Knight's success in South Korea and elsewhere come as a surprise? We always knew that idlers and action RPGs have been quite successful in Asian markets. Our goal was to create something that would appeal to all audiences globally, but not to target a specific area. Trying to find something universally appealing forced us to search for a deeper metagame and ensure players can continuously land satisfying multikills. What's the next step for Nonstop Knight? We are pushing content updates - coming soon - and listening to our fans, adding more weapons, gear and levels to explore. It´s interesting to see that when not having an in-built chat system in the game, players go to forums to share ideas and to compare builds. We´ll definitely be monitoring those places where our fans gather and listen to what they have to say!